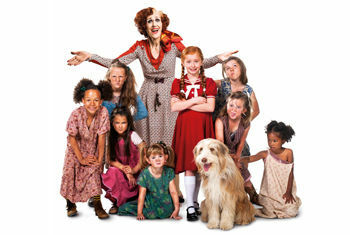 Michael Harrison and David Ian are delighted to announce that Anita Dobson will star as ‘Miss Hannigan’ in their smash hit production of the musical ANNIE playingat the Alhambra Theatre in Bradford from Monday 22 to Saturday 27 April 2019. Further casting to be announced. As Angie Watts in EastEnders, Anita Dobson created one of the most popular characters in television winning numerous awards. Her West End theatre credits include ‘Madame Morrible’ in Wicked, ‘Mama Morton’ in Chicago, ‘Mrs Meers’ in Thoroughly Modern Mille, ‘Chris’ in Calendar Girls, ‘Joan Crawford’ in Bette and Joan and ‘Nancy’ in Frozen at the National Theatre for which she was nominated for an Olivier, Evening Standard and London Critics Award. Her film credits include London Road. With its award-winning book and score, this stunning new production includes the unforgettable songs It’s the Hard Knock Life, Easy Street, I Don’t Need Anything But You and Tomorrow. ANNIE is directed by Nikolai Foster with set and costume design by Colin Richmond, choreography by Nick Winston, lighting by Ben Cracknell and sound design by Richard Brooker.